Oh, Almond, Almond! Where have you gone? Thanks to the infestation of Starbucks, Tulleys and other coffee bars, old fashioned kissaten (cafes) like Almond are dropping like flies. The first time I walked by Roppongi Crossing after Almond's demise, I felt a profound sense of remorse. And not just because I was not there to salvage some signage from the maw of the wrecking ball (though that would have been nice). While the name "Almond" suggested that the cakes and drinks waiting inside must be delicious, I only actually drank coffee there once (it was lousy). Yet the retro color scheme -- dainty pink and white awning plus contrasting, black letters -- continued to project such an enticing image. It conjured up associations with ice cream parlors and confectioneries as they ought to be. Like something out of my childhood or at least out of a book I might have read during my childhood. 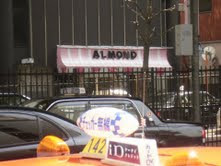 But now that the Roppongi outlet is gone, Almond corner just isn't the same. I do not even feel right meeting people there anymore. And from looks of things, I would say the two Almonds straddling Nishi-Azabu intersection (see photos above and below) are not long for this world either. Before they disappear, the super-graphics adorning the facade of the above shop merit a little appreciation. I drive past this building several times a week but never noticed the jumbo letters until last week when the spring weather put a spring in my step and I decided to walk, instead of ride, home from the gym. Though faded and worn, it is easy to imagine this signage in all its glory. And despite the smudges, the pink and white color stripes still evoke delight.